Whether you are searching for a classic hamburger or a unique gourmet option finished off with every topping your heart desires, there is a burger joint in Colorado to meet your needs. All of these burger joints are beloved by Coloradans for having fresh meat, unique toppings and hot fries. Be like a true Coloradan and top your burger with green chile peppers, or experience something new by topping your burger with peanut butter or a fried egg. No matter how you like your burger, these 10 best burger joints are here to serve up the best burger of your life. The Cherry Cricket has been grillin’ up some of the best burgers in Denver since 1945. 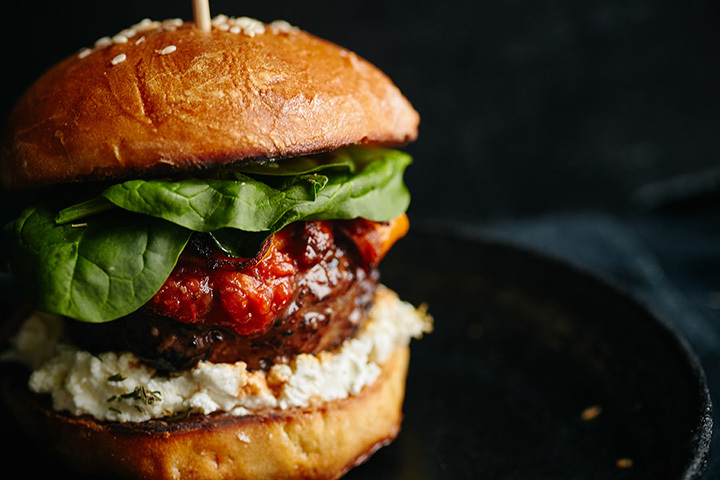 The “Cricket Burger” is a classic favorite that is sure to cure your burger craving. However the best things about the Cherry Cricket are the toppings and craft beer. There are over 30 different cheeses to choose from for your cheeseburger. And the interesting sauces and toppings, such as grilled pineapple, peanut butter, a fried egg, green chile or grape jelly, will make your burger just as unique as you are. Get a Certified Colorado ground beef patty at Crave Real Burgers. This beloved burger joint has grown to multiple locations in the Centennial State. Crave makes a great classic burger. However if you are looking for something unique, this place is the spot. Get your burger on a regular bun or between two grilled cheese sandwiches or even glazed doughnuts. With a variety of topping, sauce and bun options, this place is perfect for the adventurous eater. For a great burger, whether you crave an average burger or something more unique, head to Highland Tap & Burger. The food brings in the crowds but the atmosphere keeps people coming back. With Colorado beers on tap, a great patio and plenty of big screen TVs for the sports fans, Highland seems to have what burgers lovers want. Larkburger is a Colorado favorite with 13 locations statewide. This environmentally-friendly burger joint not only offers beef burgers but turkey, ahi tuna and veggie options too. However if you have a hankering for a good burger, try nothing else than the classic Lark, which consists of Black angus beef. All sauces and dressings are made in-house at Larkburger. Don’t walk out the door without trying the truffle fries. TAG has a strategy for burger success. Any and all picky eaters will have a blast at TAG choosing their own options for the perfect burger. First choose your protein, where options vary from classic beef to veggie to bison to even salmon. Then select your bun, with options gluten-free eaters will applaud. Lastly, don’t forget the toppings, many of which come from local artisans. The Andrew Jackson burger seems to be a popular selection, which is a burger made with three different meats and topped with black truffles, an egg and brie. With four locations in Denver, you’re sure to get your munch on at Park Burger no matter where you are in the Mile High City. Vegetarians and carnivores alike will all find something to enjoy at this burger joint. The veggie burger is one of the best in the city but the one-third of a pound beef burgers are what make this burger joint so popular. Get your classic burger fix or try a creative combination, such as the O’Neil that is complete with sliced green apple, caramelized onions and brie. My Brother’s Bar is known as the oldest bar in Denver. For cheap and greasy burgers in a laid-back environment, My Brother’s Bar has got you covered. The JCB burger is an all-time favorite since its smothered with jalapeño cream cheese. The fully-loaded condiment caddy will make sure your burger is to your liking. If you find yourself in northern Colorado and you have a hankering for a hamburger, head to Stuft. Stuft prides itself on giving you what you want by offering a variety of meat, cheese, sauce and topping options. You can even get a pretzel bun or glazed donut in lieu of your regular bread bun. Bacon lovers will rejoice at Big Al’s Burgers & Dogs. The most popular burger on the menu is the 60/40, which is 60 percent beef and 40 percent bacon. Big Al’s offers only hormone-free and locally-sourced beef. Even those who don’t eat meat or gluten will find a delicious option at this Fort Collins burger joint. Bingo Burger’s first location opened in 2010 and has been serving incredible burgers, fries, milkshakes and craft beer ever since. Now don’t walk out of this burger joint without trying the Bingo Burger. The town of Pueblo is known for its locally-grown green chile peppers. These green chile peppers alone have impacted Colorado cuisine in the most delicious way, including the Bingo Burger. Mixed with beef and green chile peppers, the Bingo Burger is truly a Colorado classic.